But more than a goal on a project, this was a milestone on a journey, a journey that began a little over two years ago for me. After we initially laid out a structure for the book each of us had a tentative topic for our own chapter. My topic was servant leadership. We were advised to not start writing until the structure was finalized and we had our official topics. But with my situation I felt a need to get a jump on the assignment and so I started to write. The project hit a point where it needed to reboot. After the book plan was restructured I had a new tentative topic – authenticity. Again we were told to wait, again I started to write. Then the final assignments came out and my new topic was – trust. Ugh. Now we were given the go ahead to write but I struggled to see how trust energizes leadership. Trust doesn’t really energize leadership, it’s the very foundation of leadership. If you’re lacking trust you don’t have un-energized leadership, you have no leadership at all. I completed my chapter on trust and submitted it to the core team. This group of five of the authors had the daunting task of making sure that all 16 chapters fit together as a cohesive book while retaining the unique nature of each chapter. To no surprise they came back to me with a number of suggested modifications to my chapter. I rewrote my chapter using their ideas and new ideas of my own, and I resubmitted it to the team. So again I began to rewrite my chapter, this time on the topic of trust in the context of servant leadership. As I was doing so there was a moment of epiphany. I have studied servant leadership for some time and have read the writings of Robert Greenleaf. I knew well that a servant leader is servant first and leadership flows from service. But I had struggled to fully understand exactly how it is that service connects to leadership. As I was writing it dawned on me that the key is trust. Service builds trust. Trust builds leadership. Now I understood. This is how service grows into energized leadership. We don’t need to muster up to high standards of expectations in order to become a leader. Rather it starts with bringing our unique self to the world in service to all. In authentic service we build trust. And then in trust we build leadership. This became my central message. Once again I sent my chapter to the core team. It was accepted and passed along to the editor. When I received it back from the editor she suggested some small modifications. One change was the topic which now was simply servant leadership. Trust was still very much a part of the chapter but incorporating her suggestions and a couple small changes of my own the focus became servant leadership. Though my topic ended up back where it started, had it not been for the journey that took me hither and yon and challenged me I would not have gained this insight and new understanding. The obstacles that threaten to drain us can actually energize us and become stepping stones to new heights. What a journey it has been and continues to be. My gratitude goes to the marvelous leaders with whom I have traveled. A special thank you to the core team of LaRae Quy, Terri Klass, Karin Hurt, Alli Polin and Chery Gegelman. I hesitate to say that publication of the book means the completion of our project, because our goal was never simply to write a book. 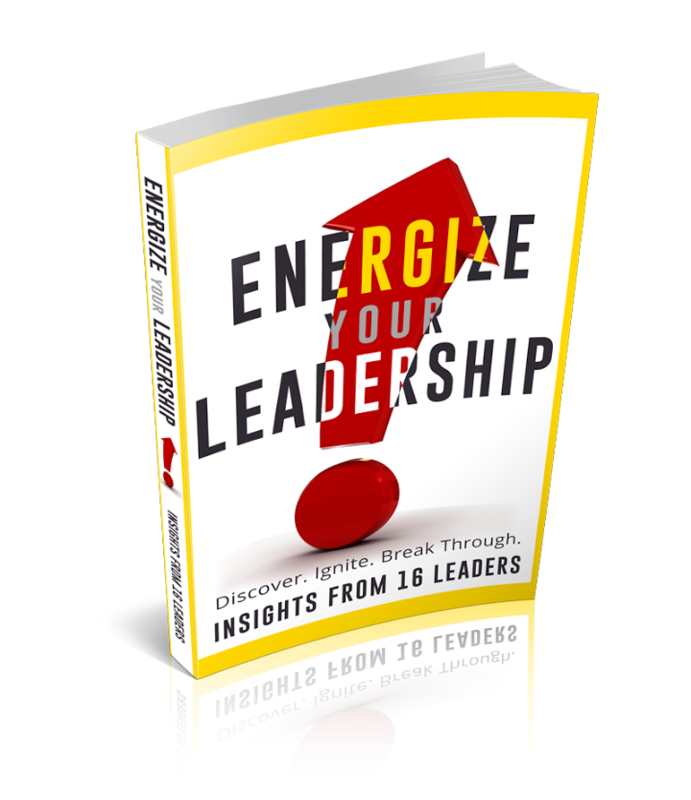 We are joined in a concern for the lack of energy we see in leaders around us. We share a vision that people will discover the energy to lead, ignite the passion of their purpose and break through the challenges they face. Whatever direction the project may take from here the journey definitely goes on. If you are struggling to find the energy you need to lead with passion and purpose, find a copy of the book and c’mon in. Let us share with you the struggles we have faced and the lessons we learned. Each of the 16 chapters has its own topic, its own story, its own insights and I believe you will find a message that speaks to you. For more information go to www.EnergizeYourLeadership.net. To obtain a copy go to Amazon.com, the link here in the United States is www.amazon.com/Energize-Your-Leadership-Discover-Through/dp/1507894910. Stay energized & lead on! This entry was posted in Leadership and tagged energize your leadership, energy, Leadership, servant leadership, service, trust, Writing. Brilliant, authentic servant leadership perspective! Daniel – Wow! How interesting that the writing of the book was energizing, then draining, then filled with learning and then energy! What a perfect reminder to all of us, this is the process of life if we don’t give up when we are feeling drained. Thank you for hanging in there! I love your insights!